The Nile crocodile is primarily a freshwater inhabitant with a native range throughout sub-Saharan Africa. The crocodile is known for its large size, reaching sizes longer than 20 feet and several thousand pounds. Nile crocodiles are aggressive, and mature individuals will ambush any prey that enters their strike zone. This includes humans, livestock and other predators, with the exception of full-grown elephants and hippos. 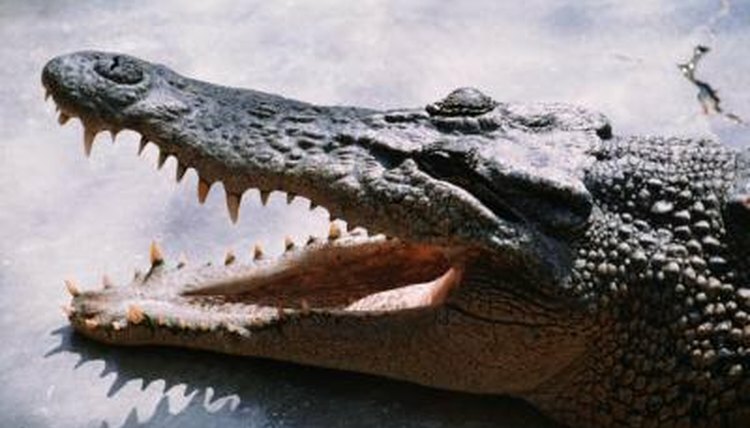 Nile crocodiles do not breed until they reach sexual maturity. Maturity is determined by the length of the crocodile. Males are prepared to breed after passing the 10-foot mark. Females are ready to breed around the 7-foot mark. Some females will not mature until they pass 8 feet in length. Nile crocodile breeding varies based on the location. The crocodiles also adjust their breeding season slightly according to the conditions. Crocodile breeding occurs during the wet season in southern Africa and during the dry season in northern Africa. Wet season breeding begins as early as November but can happen as late as February, with eggs not being immediately deposited. Dry season breeding occurs during June and July. Courtship involves posturing and noise-making from the males. The males slap their snouts and tails on the water. They also raise their heads and chest to show off their bodies. They will bellow and make a racket to attract females. The male crocodile selects a female during the courtship process and stalks her while making a display. The female may reject the male and swim away. The male approaches the female in shallow water where they rub jaws. After rubbing jaws the male mounts the female for copulation. After copulation is complete the female will hold the eggs and sperm until she is prepared to deposit. She will not deposit the eggs until the conditions are acceptable. This may last for several months, depending on the circumstances. When the conditions are acceptable, the female digs a hole and deposits the fertilized eggs. The female and the male guard the nest during the incubation period. This lasts for two to three months. After the eggs hatch, the young remain close to the female for several years. What Is the Climate Where Crocodiles Live?